Oh, Project Life, I certainly hadn’t intended to get this far behind! Life has been crazy. Absolutely crazy. And I think perhaps the method I was using to keep me on track – taking notes on my iPhone in Evernote – just wasn’t the right one for me. I’m a paper and pencil person, and I’m making some adjustments that will hopefully help with the notetaking part of things. But week 10…which already seems so long ago. I’ve been obsessed with turquoise and red forever – at least since middle school. It just seemed to work for this week, and I love the way it looks against kraft. 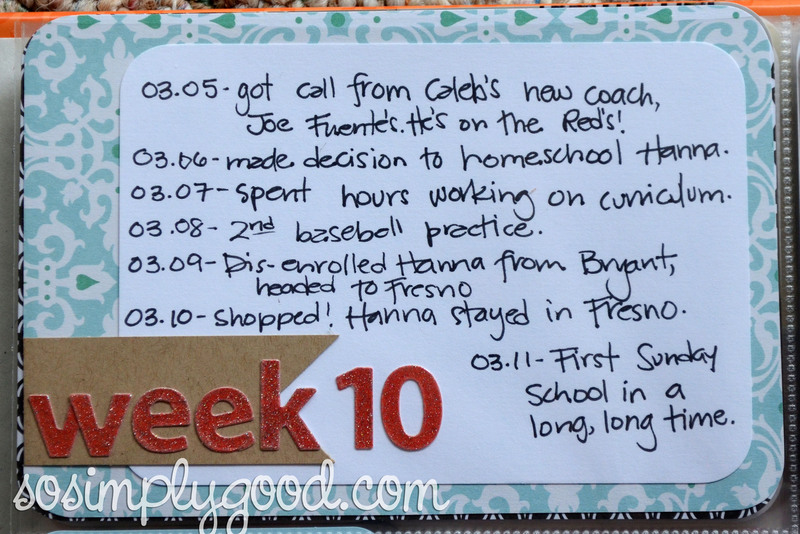 The week’s Week in Review card – This is my favorite slot to fill each week, and it’s the one I do last. It tends to be the leftovers that make up our week full of those little things that maybe don’t have pictures but are important for one reason or another. The whole right side is about Sunday School. It was a big deal in the life of our little church that we have Sunday School for the kids again after many years. There’s also a card about a prayer vigil we had this week – not something I felt it would be appropriate to photograph, but wanted to include. 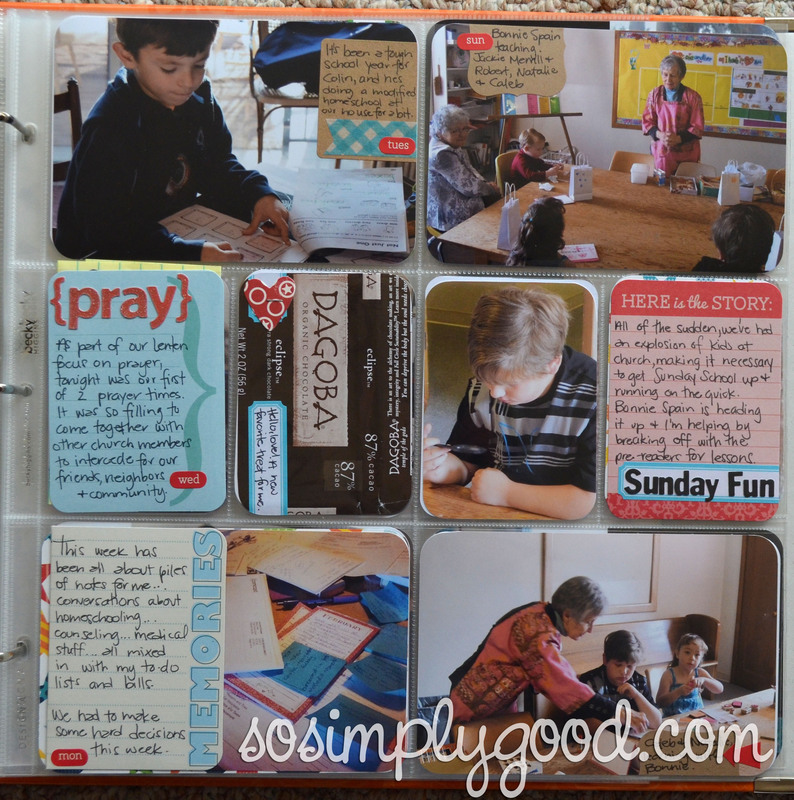 There’s also some more personal journaling on the inside of the folded Memories card at the bottom. 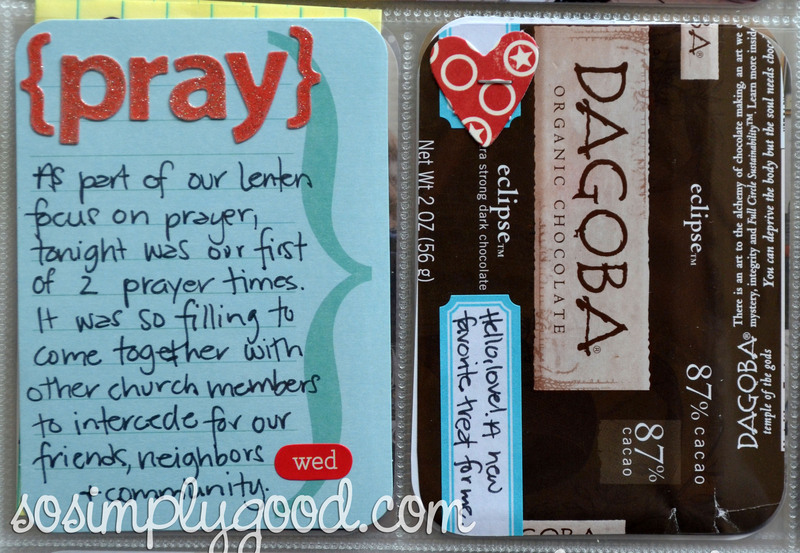 I also included a Dagoba chocolate wrapper – I’m a bit of a dark chocolate snob and don’t consider much of anything below 80% to be worthy of the name. This Dagoba is my new, unfortunately ridiculously expensive favorite. From a visual standpoint, this week is one of my favorites. It’s also when things started to fall apart a bit and I started getting really behind. This week, I’m working on getting caught back up, in bite sized pieces. I came up with a daily log space for each day and notes about memorabilia on the front and a sketch of the Plan A page protectors on the back. Today, I jotted notes for all of the weeks I missed, and I’ll start sorting, planning and editing photos this afternoon. I’m also going to use this log from here on out for taking notes each week – I’ll just leave it out on my desk and jot things down as I feel the need. I’m crossing my fingers that this keeps me more up to date. 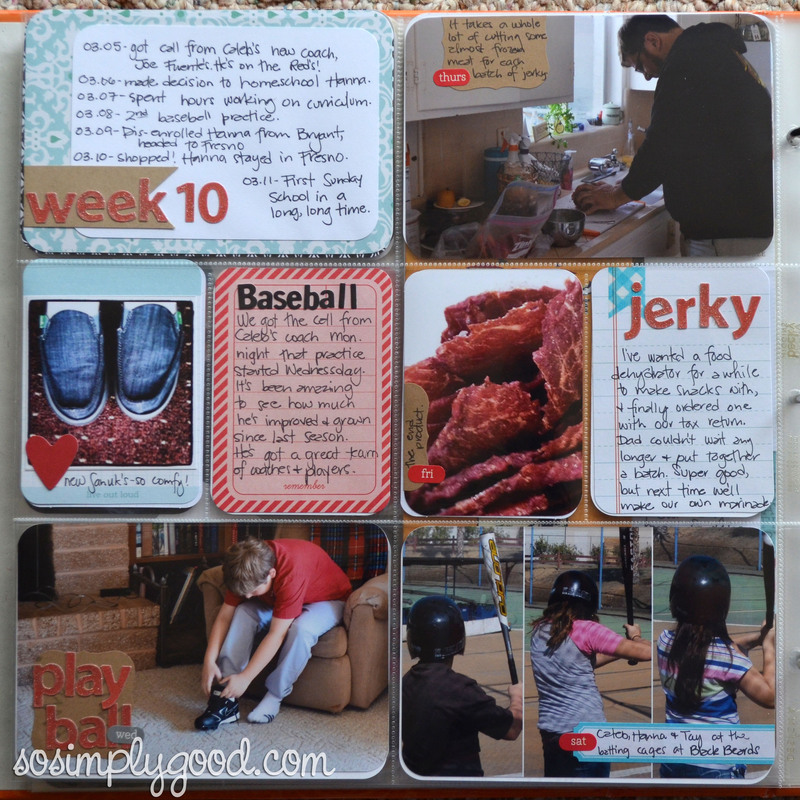 This entry was posted in Project Life and tagged memory keeping, Project Life, scrapbook, scrapbooking by Awkward Girl Gets Fit. Bookmark the permalink.